Back cover blurb: Quentin and Lottie Bredin, like many modern couples, can't afford to divorce. Having lost their jobs in the recession, they can't afford to go on living in London; instead, they must downsize and move their three children to a house in a remote part of Devon. Arrogant and adulterous, Quentin can't understand why Lottie is so angry; devastated and humiliated, Lottie feels herself to have been intolerably wounded. Mud, mice and quarrels are one thing - but why is their rent so low? What is the mystery surrounding their unappealing new home? The beauty of the landscape is ravishing, yet it conceals a dark side involving poverty, revenge, abuse and violence which will rise up to threaten them. Quentin and Lottie Bredin should be getting a divorce, but they can't afford it. Lottie, Quentin, Lotties son Xan (Alexander) and the couples daughters, Stella and Rosie must instead live in a constant state of disharmony. Lottie thought she'd be with Quentin forever, but she can't trust him since she found out about his affair. Having moved out of the family home, Quentin suddenly reappears in their lives and puts his feet firmly back under the table much to Xan's disgust. When Lottie finds a cottage in a remote part of Devon for a reasonable price and tenants from Canada to rent their London home she thinks she has her future sorted. Quentin will only be with them until he can afford to move on. Quentin is a horrible oaf of a character, pig-headed, arrogant and thoroughly unpleasant to all those around him even his own parents. Lottie in contrast is lovely, though thoroughly devastated and embittered by her husbands adulterous behaviour. What keeps her together is her children. Xan though is my favourite character, his love for his Mother, hatred for his Step Father (and his treatment of Lottie) and his anxiety about his future. Does it lie in Devon or should he return to London for University? 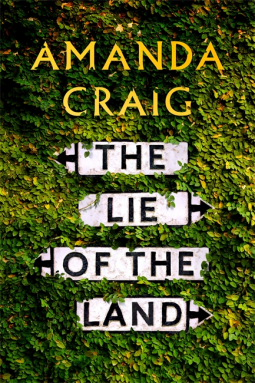 The Lie of the Land is a beautifully written character driven novel, that will delight those looking for something a little different this summer. The Lie of the Land is available via Amazon online and all good book shops.